These Custom Leatherette Dice Cups are made of high-quality materials and they have a solid look and feel. Each cup features a handsome leather-like vinyl exterior and a padded/felt interior. 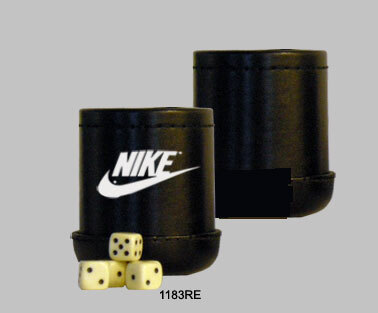 Your design/logo is imprinted on one side of each Dice Cup. Each Custom-Imprinted Dice Cup comes with five 5/8" white dice. Other dice colors (black, blue, green, red, and yellow) are available for an additional $0.75 (V) per cup.